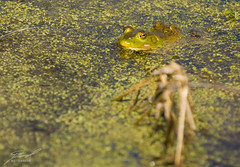 At the head of the Kensington Metropark's Nature Trail is a small pond full of frog and turtles. Its fun to stand at the fence and count the numbers of frogs and turtles you can see, but the hard part is still getting a good shot. Would anyone care to buy me the 200-400mm f/4G ED-IF AF-S VR Zoom-Nikkor?